Is it possible to setup a CI build which is triggered only on a checkin(push) to a specific folder? I just found a way how to hook the build to a checkin to a specific branch. We have one Git repository for all our products. Each Product has a subfolder in a Git Root. 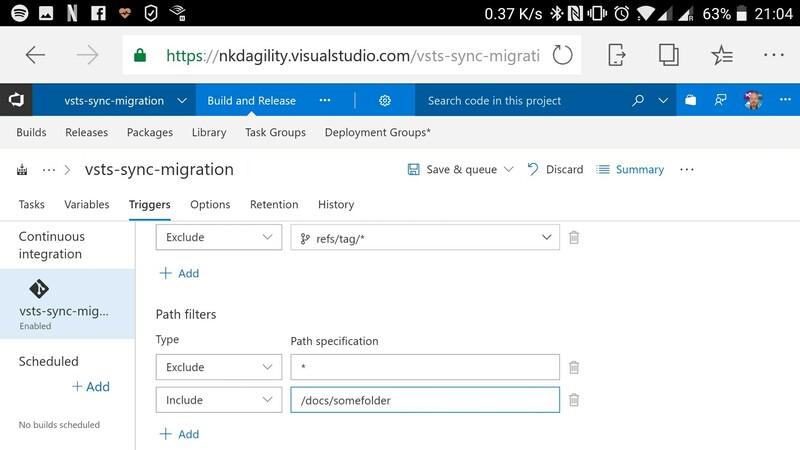 And such a project corresponds to a Team in VS and has its own SCRUM product backlog(http://geekswithblogs.net/Optikal/archive/2013/09/05/153944.aspx). You should split each of your products into it's own Git repository. The only separation that exists inside of a Git repo is for branches. There are git commands to split folders off into their own repo with history. Update 2017: You can add branch filters in VSTS now. To only trigger on a single folder you would like have to exclude everything and then include only that folder.